Thanks for visiting my blog. Sorry for the lack of posts lately. November has been a busy month. December will be the same as well. My weekends from now till December is fully booked. 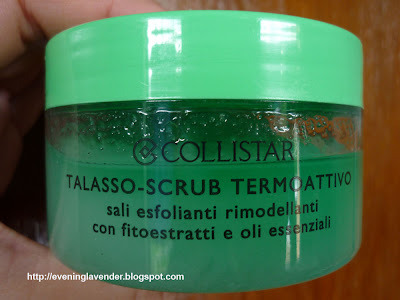 Today I will be reviewing the Collistar Thermoactive Talasso Scrub. This deluxe sample size (150g) is provided by SaSa Malaysia for the purpose of product review. 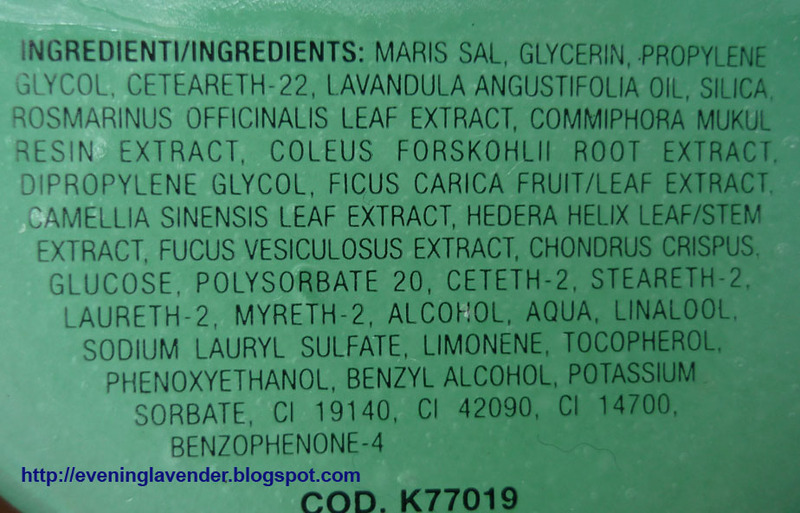 The moment I opened the bottle, I can recognize that this product contains Lavender and Rosemary essential oil. 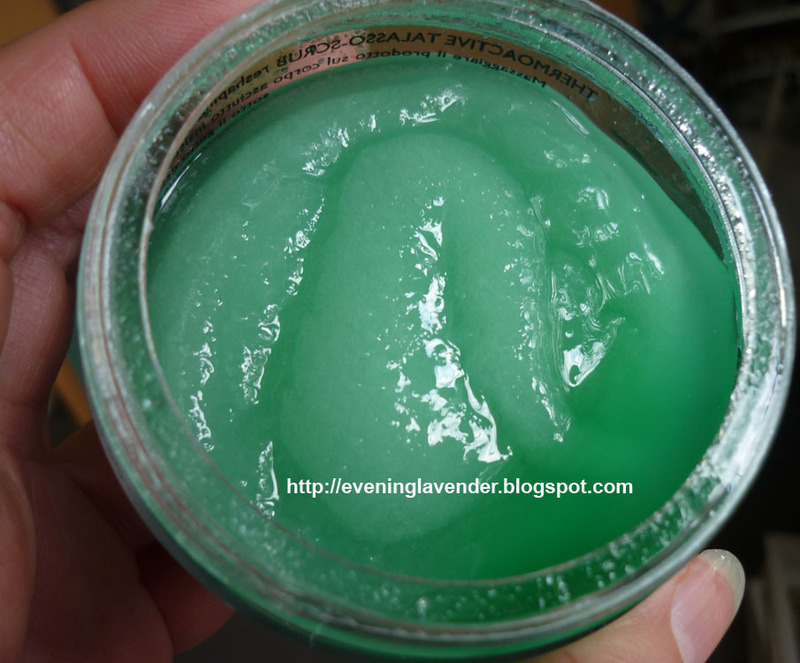 So, I read the ingredients list and true enough, stated there are Lavandula Angustifolia (i.e. Lavender essential oil's scientific name) and Rosmarinus Officinalis (i.e. Rosemary). As I am a user of essential oil, I am really happy to see both ingredients in this scrub. 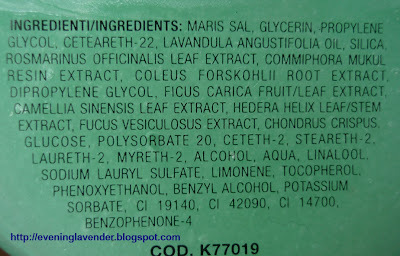 However, on the down side I also spotted SLS - Sodium Lauryl Sulfate in the ingredients list. A special heat-effect thalasso treatment designed to exfoliate and reshape the body. Exfoliating action - Sea salts leave the skin instantly smoother, brighter and more toned. Remodelling effectiveness - Six different plant extracts with strong lipolitic proper ties act in synergy to reduce accumulations of fat. Their effectiveness is boosted by the heat effect, which stimulates the skin microcirculation and helps the active principles to penetrate, and by the draining action performed by osmosis by the sea salts. Revitalizing power - Lavender and rosemary essential oils revive the skin and give energy and wellbeing to the organism. The scrub uses the principle of stimulating our skin's microcirculation to create the heat effect similar to a slim-wrap effect. Main Ingredients: 90 types of sea salt, glycerine, green tea, ivy, fig shoots, essential oil of Rosmary and Lavender. How to use this body scrub? Mix the product with a spatula, massage it over the DRY body and rinse off under the shower. For best results, use once or twice a week. What I like about this product is of course the smell of Lavender and Rosemary essential oil. The aromatherapy scent awakens my senses and I feel like I am enjoying a spa except there is no spa lady to attend to me. After scrubbing my body for about 3-5 mins, the salt becomes a bit wet and I feel a slight warming sensation on my skin. I only concentrate on areas with fat deposits (I think you know where). Thereafter, I shower off the salt and wash my body with my body wash. The result: My skin feels super smooth like a baby's skin. This product is available at all SASA outlets. It retails at RM145 for 700g. I can't comment on whether this product can effectively reduce body fat as I only used it for 3 times. If this product can work, I don't mind buying it as it is not expensive as compared to the slimming therapies that cost a few thousands. However, knowing myself I doubt that I will be very diligent in using it because scrubbing is hard work. But wait.....I got an idea, you can bring it to your massage lady to do it for you. How about that? I will leave you with this wild suggestion. Stay tune my beauty friends and share your thoughts in my comment box ya... Thanks for visiting.